Celebrating family and friendship, the story unfolds in Atlanta, Georgia, as Cyrus DeBarge (Tyler James Williams) and his best friend Kris McDuffy (Trevor Jackson) reunite with their childhood friend, teenage singing sensation Roxanne “Roxie” Andrews (Coco Jones), whose music label is sponsoring a songwriting contest at a teen club. Cyrus, who writes music under the name “Truth,” crafts a heartfelt and contest-winning rhyme about Roxie but to his dismay, his work is mistakenly attributed to Kris. Lacking the confidence to step forward, Cyrus stands by while Kris not only takes credit for the lyrics, but ultimately begins to win Roxie’s heart too. Now, it’s up to the true poet to overcome self-doubt, seize the opportunity to reveal his authentic self, and pursue his dreams. Bonus materials include an exclusive extended scene of Cyrus' rap battle!! BURBANK, Calif. May 4, 2012 – The energetic and music-driven Disney Channel Original Movie “Let It Shine: Extended Edition” featuring an exclusive extended music scene arrives as a 1-Disc DVD (DVD + Digital Copy on the same disc) on August 7, 2012. Set in the world of hip-hop, rap and gospel music, the uplifting modern day story inspired by Cyrano de Bergerac stars Tyler James Williams, Coco Jones, Trevor Jackson, Brandon Mychal Smith, Nicole Sullivan, Dawnn Lewis, Alex Desert and Courtney B. Vance. “Let It Shine” will premiere Friday, June 15 (8:00 p.m. ET/PT) on Disney Channel. Celebrating family and friendship, the story unfolds in Atlanta, Georgia, as Cyrus DeBarge (Tyler James Williams) and his best friend Kris McDuffy (Trevor Jackson) reunite with their childhood friend, teenage singing sensation Roxanne “Roxie” Andrews (Coco Jones), whose music label is sponsoring a songwriting contest at a teen club. Cyrus, who writes music under the name “Truth,” crafts a heartfelt and contest-winning rhyme about Roxie but to his dismay, his work is mistakenly attributed to Kris. Lacking the confidence to step forward, Cyrus stands by while Kris not onlytakes credit for the lyrics, but ultimately begins to win Roxie’s heart too. Now, it’s up to the true poet to overcome self-doubt, seize the opportunity to reveal his authentic self, and pursue his dreams. At the same time, Cyrus must convince his preacher father (Courtney B. Vance) that hip-hop music can convey a positive message. 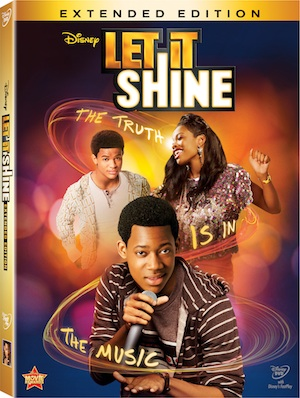 Available only on the “Let It Shine: Extended Edition” DVD is the exclusive extended scene featuring Cyrus in his first-ever rap battle of the rhymes against his nemesis, Bling, to establish which performer is the more talented verse master. The truth is in the music! The 12-song “Let It Shine” soundtrack, from Walt Disney Records releasing on June 12th features tracks by songwriters Antonina Armato, David Banner, Andy Dodd, In-Q, J-Doe, Toby Gad, Adam Hicks, Tim James, Steven Jones, Jay L’Oreal, Justin Mobley, Tocarra Phillips, Lindy Robbins, Thomas Armato Sturges, Dapo Torimiro, Anya Vasilenko, Jon Vella, Lambert “Stereo” Waldrip and Adam Watts. “Let It Shine” is directed by two-time DGA award winner Paul Hoen (“Camp Rock 2: The Final Jam,” “JONAS”), written by Eric Daniel and Don D. Scott (“Barbershop,” “Barbershop 2: Back in Business”) and choreographed by Danny Teeson (“American Idol”) and associate Brandon Shaw (“So You Think You Can Dance,” NAACP Image Awards). A production of G WaveProductions, LLC., the movie was shot on location in Atlanta and Marietta, Georgia.